No Bull! London has swine flu in a popular high street shop, animals on the underground everything from bats to woodpeckers. 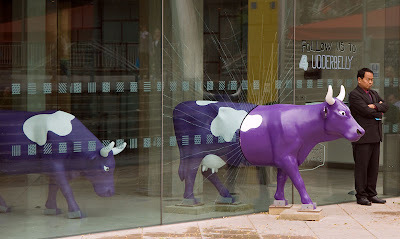 And, just for summer an udderly good time with purple cows. Its a funny picture and like Laurent says above ...........I Love it! Only made better by the grumpy security guard standing next to it! LOL this one is priceless!!! I'm surprised these are still around. I guess I've become accustomed to them. Tho I did see a few in Madrid last Feb. Clever coming through the glass. It has been several years since the painted cows lined our streets. This is strange but cool! Holy cow! You do find some of the oddest things in London, Mo! Love it! Ha, ha! What a great shot! But about the swine flu, it is really a good thing to have the swine flu now if you are in good condition, it is the best vaccine if the swine flu is becoming more dangerous later. Your commentary is very amusing.... nice post! These are obviously alien cows. Why hasn't anyone noticed? Udder! Love the word play. My town did a similar thing where they put painted huskie dogs on the street corners. This is now one of my all-time favorites. Great that you saw it and shared it with us. Thanks! Reminiscent of cows on parade in Chicago, IL U.S.A.
Amusement with a not so amused onlooker.